Born in Yunyang, Chongqing Province in 1983 and graduated in 2010 from Sichuan Fine Arts Institute with a BFA in Oil Painting, Tao Hui currently lives and works in Beijing. 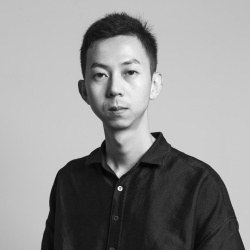 He won the special award of Contemporary Art Archive from Sichuan Fine Arts Institute in 2008, and the Grand Prize at Contemporary Art Festival Sesc_VideoBrasil in 2015; he had also been shortlisted twice in two previous editions. Tao Hui is also the winner of Art Sanya & Huayu Youth Grand Award in 2015. His solo exhibitions include: “New Directions: Tao Hui”, UCCA, Beijing (2015); “1 Character & 7 Materials”, AIKE-DELLARCO, Shanghai (2015). Group exhibitions include: “The mulberry forest becoming ocean”, Esther Schipper, Berlin, Germany (2017); “Hack Space”, K11 Foundation Pop-up Space, Hong Kong (2016); “M+ Screening: Forty Years”, Broadway Cinematheque, Hong Kong (2016); “Why Not Ask Again”, 11th Shanghai Biennale, Power Station of Art, Shanghai (2016); “Turning Point: Contemporary Art in China since 2000”, Minsheng Art Museum, Shanghai (2016); “TUTORIALS—Moving Images and a User’s Guide from China”, Museo Pino Pascali, Polignano a Mare, Italy (2016); “Bentu: Chinese Artists in a Time of Turbulence and Transformation”, Foundation Louis Vuitton, Paris, France (2016); “Essential Matters—Moving Images from China”, Borusan Contemporary, Istanbul, Turkey (2015); “Southern Panoramas”, Contemporary Art Festival_Videobrasil, São Paulo, Brazil (2013).